The photos I used for this page are of my daughter McKayla at the beach in Fort Myers Beach. In the largest photo McKayla is holding up a seashell she found on the beach. I loved using mixed media on this page. I used a gift card to spread blue and gold acrylic paint on a sheet of white 12″ x 12″ cardstock. After the acrylic paint dried I added modeling paste to the page by using a gift card and spreading the past through a journaling stencil. I chose the stencil because of the wavy lines. The modeling paste had a some height to it when it dried and I wanted my photos to overlap a little of the modeling paste lines so I added foam to the back of the phote cluster to adjust for the height difference. I used a scrap of patterned paper and a beach sign stamp to make the tag to the left of the photo. 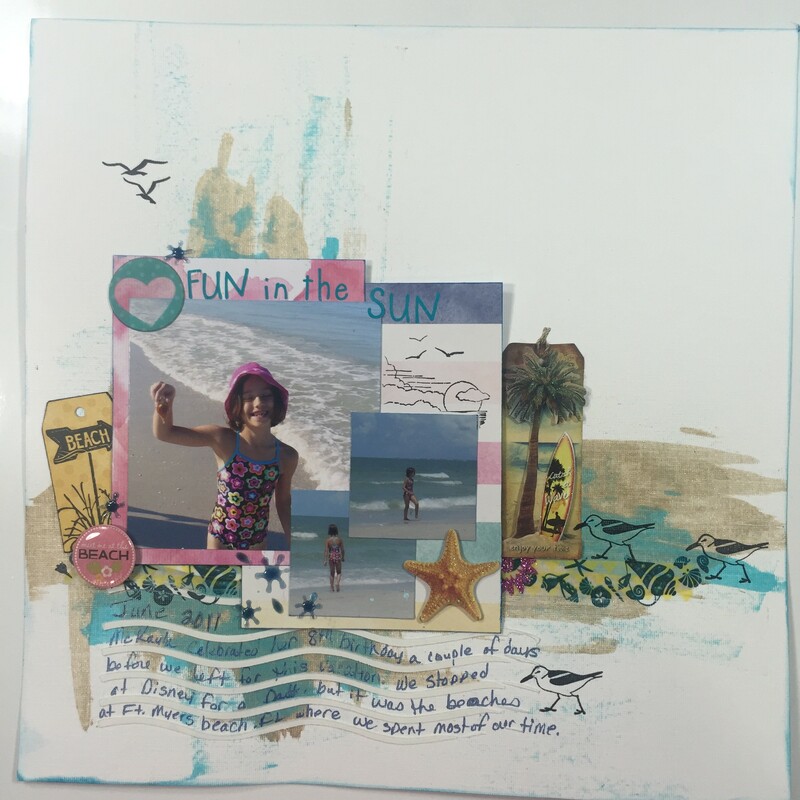 I used two beach themed Fiskars stamp sets for this page. In addition to the beach sign tag I also stamped seagulls, seashells and a part of a sun onto the page. I had so much fun working with stamps and mixed media on this layout and I love how the page turned out! 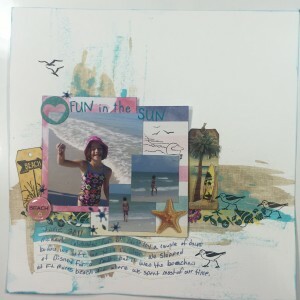 Below is a process video for my “Fun in the Sun” scrapbook page.